Extra! Extra! We’ve got the inside scoop on Capo’s Gelato Social! On Sunday, July 22nd you’re invited to Capo’s house-made gelato with a do-it-yourself toppings bar! The Gelato Social takes place from 3:00 – 5:00 pm at 443 W Broadway. Tickets are $10 and can be purchased here! Can’t make it – Capo’s Gelato Cart is open 7 days a week! Stop by for a taste! Questions? Email kate@brgboston.com or give us a call at 617-993-8080. Camp in the great outdoors of the Lawn on D! On Friday, July 20th The Lawn on D will transform into real life adult Camp Wannamango with Harpoon Brewery and L.L. Bean. They’ll have relay games (who can set up a tent the fastest? ), exclusive L.L. Bean prizes, and, naturally, a ton of beer. They’ll be solving that age-old problem of camping in the city – Camp Wannamango style. Did you even know you needed an L.L.Bean Adventure Dome 4-Person Tent or Adventure Sleeping Bag? No? Well, now you do. You need them. Check out Fort Independence at Castle Island! The Castle Island Association (CIA) has been giving free guided tours of Fort Independence on Castle Island for over thirty years. Enjoy a tour every Saturday, Sunday, and on national holidays through the summer from noon till 3:30 pm. You can also enjoy a sunset tour on Thursday at 6 pm. Movie night! Hub Church is hosting not one, but two free movie nights on July 19th and July 20th at M Street Beach at sunset. On July 19th enjoy Sherlock Gnomes and on July 20th it the classic Jurassic Park! Free movie, popcorn and drinks! Breath and move! Enjoy free all-levels vines flow at Castle Island Yoga on July 21st from 10:15am-11: 30 am taught by Yoga Around Town. Bring your own mat or towel and meet Castle Island near the information sign at Fort Independence. Classes are FREE, but we ask that you register. Walk-ups are available on a limited basis. Please register to ensure your spot in the class! The Columbia Threadneedle Investments Boston Triathlon will feature a weekend of events on July 21st and July 22nd and all the action happens along the beaches on Day Boulevard! 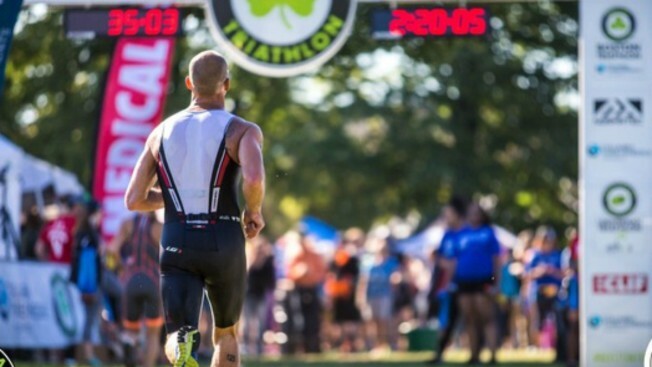 More than 2,000 athletes are expected to compete in the 10th anniversary of the Boston Triathlon including 2016 Olympian and two-time winner of the Escape from Alcatraz triathlon Ben Kanute, former North American Ironman Champion Angela Naeth, in addition to athletes from 8 countries and 42 states! If swimming, biking and running is not your thing, come out and show your support by cheering for the athletes competing! They love that! If you want to participate you have two options – Olympic Race – 1.5K swim, 35K bike, 10K run with a start time of 6:20 am or the Sprint Race – 750m swim, 17.5K bike, 5.5K run – start time at 9:15 am! For more information visit here! The swimming will take place along the beach near the McCormack Bathhouse and will be in shallow water. The run will be on the Harborwalk and around Mother’s Rest Field. Located on the historic South Boston Waterfront, the Seaport District is one of the fasted growing neighborhoods in the city of Boston. With museums, restaurants, shopping, fitness studios, a luxury movie theater, an outdoor concert pavilion, and a gorgeous harborwalk, The Seaport District has it all! Welcome to our Guide to the Seaport District! We’ve got the inside scoop on where to eat and drink, new workouts to try, shopping, special events and shows, where to park and how to get here! We’ve even included our picks on where to stay and our favorite spots for nightlife! We’ve got everything you need in our guide to help you explore this part of the neighborhood! Put your paws up – it’s Yappy Hour in the Seaport! Join the Boston Seaport Yappy Hour in Sea Green every third Thursday of the month, June through September! Enjoy a neighborhood block party event for dogs and owners with live music, pet-friendly activities, giveaways, pet and human treats from local Seaport restaurants. This event is in partnership with Elliot’s House, PAWS New England, Boston Veterinary Clinic, K9 Concierge and BarkHappy. You can register here! The post Weekend Picks – July 20th appeared first on Caught In Southie.